Will small-scale renewable energy crush municipal revenue? Sustainable Energy Africa, with funding from Renewable Energy and Energy Efficiency Programme (REEEP) recently completed a yearlong project which involved developing an accurate model to determine municipal revenue losses as a result of the uptake of energy efficiency (EE) and renewable energy (RE) interventions in its customer base. This uptake of EE and RE has seen an increase in recent years due to a variety of reasons including primarily the steeply rising electricity prices from both Eskom and the municipalities; load shedding; and to some extent due to environmental reasons. Although this revolutionary shift is essential for national and global economic and environmental sustainability reasons, currently, this has a negative financial impact on the municipalities that depend on electricity sales as a source of revenue. For most municipalities, sales from electricity is the largest source of income and as such a decrease in income can have profound effects on their ability to deliver services. The architecture of the municipal fiscal framework is such that municipalities are expected to supplement the grants they receive from national government by generating revenue through rates and the sale of electricity and water for service delivery and other municipal expenditure such as infrastructure maintenance and build. Since it is the mid-high income residential, commercial, and industrial sectors that are most likely to install RE and EE, reduced sales to these sectors results in reduced funds to cross subsidize basic services including electricity for indigent households. The REEEP funded revenue impact project set out to quantify what the impact of RE and EE into the future might be for three metropolitan municipalities in South Africa – Cape Town, eThekwini and Ekurhuleni. The impact needed to be assessed not only in terms of revenue loss to the municipality, but also in terms of the impact on municipal service delivery to the poor. It also attempted to determine potential strategies to minimise municipal losses and impact on the poor. 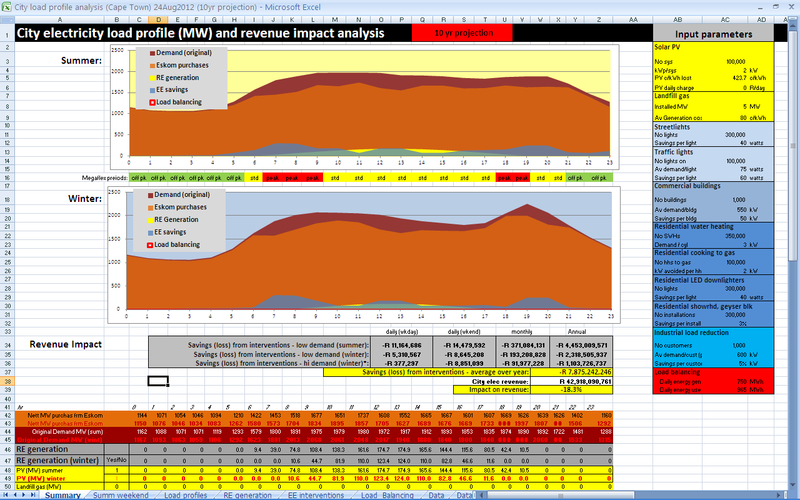 In order to determine the revenue loss impact as accurately as possible, a detailed modelling exercise was undertaken which took these tariffs into account, and sought to determine specific times during the day, week and year that electricity sales would be lost as a result of RE and EE. Projections were made over a ten year period (2013 as the base year), based on the viability of the financial case against technology cost and electricity price. A 50-85% uptake of EE interventions would be realised across all the economic sectors over the next 10 years. PV uptake varies between municipalities – Cape Town 15-50% residential; 15-50% commercial; 3-15% industrial. EThekwini 3-15% residential; 15-50% commercial; 3-15% industrial. Ekurhuleni – 2-15% residential; 15-50% commercial; 15-50% industrial. Large scale uptake is only expected thereafter, as the financial case improves. Uptake of PV in the commercial sector could be as high as 15-50% if current tariff conditions continue to apply. Assuming the above uptakes, the overall revenue losses in 10 years’ time for the metro electricity departments are projected to be between 3-11% (Cape Town), 5-15% (Ekurhuleni) and 8-15% (eThekwini). The main areas where these losses will occur are residential solar water heating and EE across all the economic sectors. The impact of PV is relatively minimal, except potentially in the sections of the commercial sector where the energy tariff is particularly high (usually small commercial tariff customers). The overall impact of revenue loss on the poor is a question of political decision making, but up to 80% of the cross subsidisation of the low income tariff could be affected, or up to half of the total amount of revenue allowed to be transferred to the rates account. The most effective revenue loss mitigation strategy discussed with metro electricity departments is the decoupling of the current electricity tariffs into the following (1) an energy charge (to cover Eskom charges) and (2) a fixed charge (to cover distribution costs). This will secure the municipal business model and even allow municipalities to encourage renewable energy and energy efficiency within their distribution network. Additionally, business processes need to become more efficient and losses need to be either absorbed or minimised. Other mitigation strategies in the pipeline include the proposed NETFIT programme funded by the Renewable Energy Independent Power Procurement Programme (REIPPP) and managed by Eskom as a component of the national strategy to grow the renewable sector. This programme will compensate the municipality for lost revenue from PV, and recompense any excess generation from PV customers. It is clear that a workable solution to the growing implementation of RE and EE needs to be found in the next 3-10 years. Decoupling lies at the heart of this solution, and without it, the long term sustainability of the electricity distribution business within South African municipalities is at risk. Securing a municipality’s finances in the face of large scale RE and EE uptake will encourage the municipality to promote a more sustainable energy future. For more information on the project contact Simisha Pather-Elias. To download the revenue impact model click here. To download the PV financial feasibility model click here. To download the instructions for both models click here.